Favorite Flickr Moments . . .
Home:Uncategorized:Favorite Flickr Moments . . .
. . . when a Flickr comment captures an image better than you did . . . I shot this photo at Ocean Beach in San Francisco, during a break in one of last winter’s storms. The winds buffeted the bluffs so hard, the ravens were flinging themselves into the headwinds, stationary — suspended in space with just a few navigational tweaks of feathers. They’d land back on the bluffs and start the process all over. They’re so transparent. We know how fun this is. Check out the story of Shade, the search and rescue raven for some insight into raven intelligence. 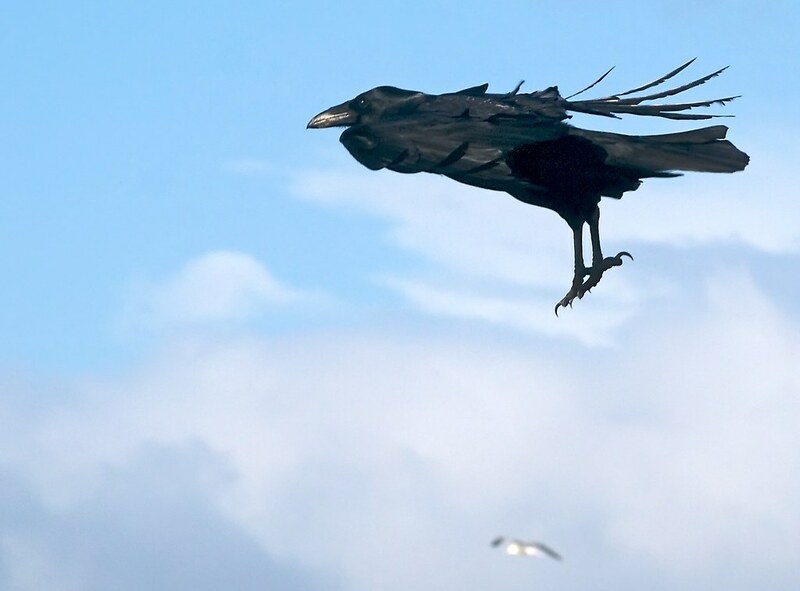 Great, great photo – I love crows, but even aside from that, this is sooooo good. Welcome to the nature blog network! Thank you — for the comment and the welcome. I agree about crows. In fact, the whole Corvid family is awesome, in the truest sense of that word.